New polling suggests Rahm Emanuel isn't playing in Chicago. Here's why—and why the national media should pay attention. Now, it wasn’t hard for me to document the various ways Emanuel dealt from the bottom of the deck all the damned time: all I had to do was compile links of the local coverage. On how his administration all but bribed teachers to support his dubious education initiatives. Or rammed through shock-doctrine anti-protest maneuvers. Or embarrassingly manipulated statistics. Or hid his pay-for-access scheduling practices from public view. Or pleaded poverty in a laughably transparent way in order to cut services for things like libraries, while passing equivalent amounts from the city treasury to favored corporate interests. Or practiced simple old-school Chicago-style cronyism. The responses I got from this humble act of second-hand journalistic aggregation proved the most extraordinary part of the exercise: reporters whose job it was to cover City Hall on a day to day basis, in an atmosphere of sickening intimidation, reached out to me with an almost absurd amount of gratitude that someone, anyone, was bringing this news to the rest of the country. Still and all, I had to report, “the approval rating of a man some say wants to be the first Jewish president is 52 percent after his first year in office”—not great, but not bad. But stick around to the end. This story may yet have a happy political ending—if the rest of the country manages to pay attention to what’s actually happening in the city. The Chicago Sun-Times recently reported that much of a $98 million state grant given to UNO to build schools was funneled to companies that have deep connections to the organization’s political allies and a top UNO executive, Miguel d’Escoto. Shortly after the story broke, d’Escoto resigned. D’Escoto Inc., a company owned by Miguel d’Escoto’s brother Federico, reaped more than $1.5 million for work as the “owner’s representative” in the construction of several schools. Reflection Window Co., owned by another d’Escoto brother, Rodrigo, stands to earn nearly $10 million for work on several schools. Plumbing contracts went to a company owned by the sister of Victor Reyes, the clout-heavy lawyer and lobbyist who helped UNO snag the state grant. UNO hired Aguila Security, a firm run by two brothers of state Rep. Edward Acevedo, a longtime UNO ally who voted to approve the UNO grant in 2009. And all this is not to mention Emanuel’s most nationally prominent policy failure—his inability to accomplish a reduction in the city’s heartbreaking epidemic of youth gun violence, horrifyingly symbolized this winter by the slaying of local 15-year-old Hadiya Pendleton about a week after she returned from performing at Barack Obama’s inauguration. Now that promised happy political ending. Voters are waking up. Crain’s Chicago Business polled 600 voting-age Illinois voters last September. 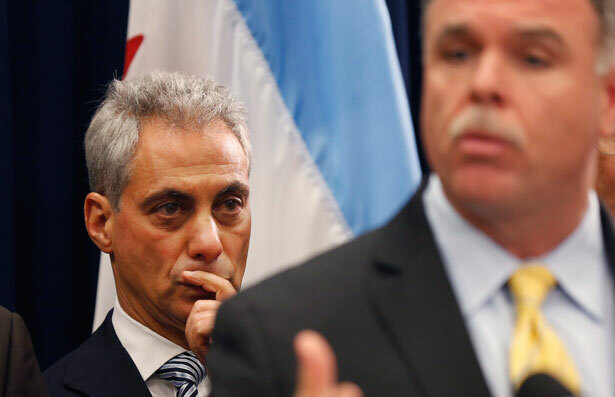 Thirty-four percent approved of Emanuel’s performance and 33 percent disapproved. It just ran the poll again. This time, 19 percent approve and 50 percent disapprove. And in Chicago proper? Thirteen percent “strongly disapprove” of his performance, 9 percent “somewhat disapprove,” and 13 percent “lean toward disapproval”—down sixteen points in net approval since September. Once more, though, the celebrity-besotted national political media hasn’t quite received the news. Last week, The Washington Post’s conventional wisdom maestro Chris Cilizza reviewed the chances of Emanuel making a respectable presidential run. He kind of liked them. He quoted Democratic pollster Mark Mellman: “I’ve known Rahm for almost 30 years and if I’ve learned anything it’s that Rahm can achieve whatever Rahm sets out to achieve.” Maybe Mellman should start reading the Chicago press—who’ve been proving that Rahm’s achieving just about nothing he’s set out to achieve. Rick Perlstein last wrote on the Oscars and why this year’s ceremony was hardly political.